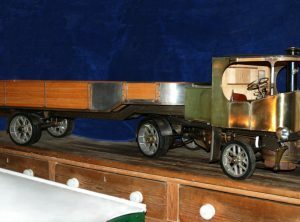 This an articulated model wagon, built exhibition quality standards. 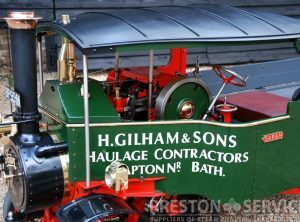 Based on the Robin Dyer designs, bodywork is finished in polished brass and is complete with many details including electric lamps and a beautifully made trailer. 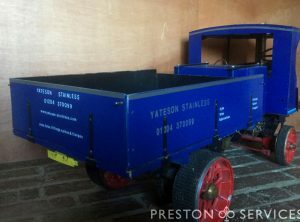 This wagon was built 9 years ago as one of a pair, by a very experienced engineer and with all the detail work faithfully reproduced from a full size ‘C type’ wagon. 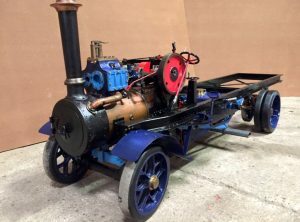 It features a proper compound engine with full ‘Simpling’ gear, 3 speeds with roller and ball bearings throughout and operates at 220 psi, as per the full size machine. 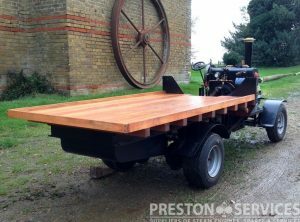 The cab accommodates 3 full size adults and wagon runs on the road, capable of travelling reasonable distances. 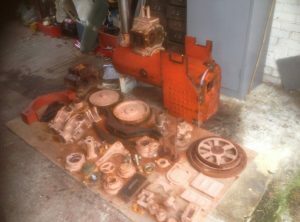 Definitely a rare and very usable machine…. 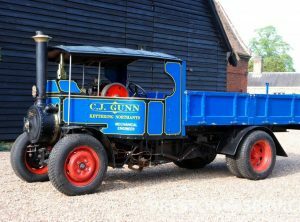 A nicely put together model Traction World “C” type Foden. 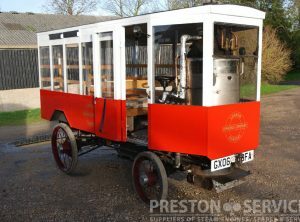 As new, fully tested and sorted and with current boiler certificates. 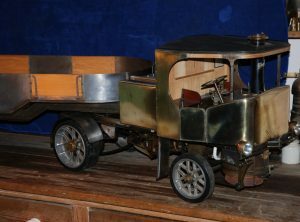 All parts, not shown, are present, including cab, motion covers, etc. 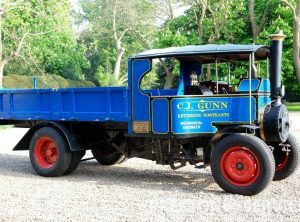 Very realistically priced for quick sale. 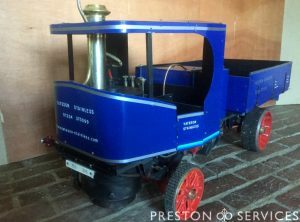 A very nice 6″ scale (half size) miniature Foden ‘C’ Type steam wagon. 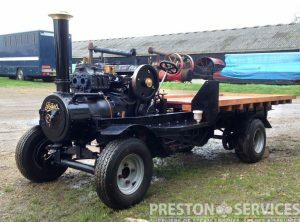 This handsome overtype wagon is fitted with pneumatic road tyres and is for sale in very nice condition, with current boiler certificates. 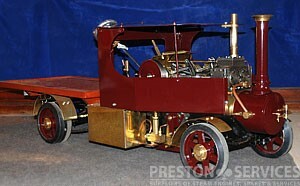 This is a unique, passenger carrying, replica steam powered omnibus. 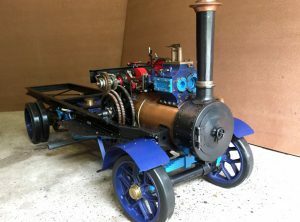 Built along Clarkson lines, with a vertical fire tube boiler and undertype steam engine. 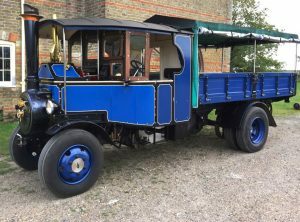 Chain drive with leaf springs, fitted with a fully enclosed bus body with passenger seats. 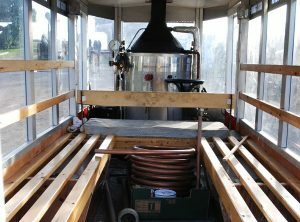 Ready to go with current boiler certificates. 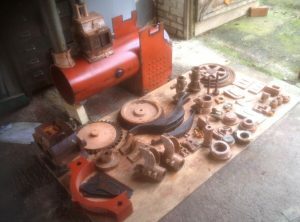 For sale is an unusual and well made set of wooden patterns for creating castings for 6″ scale (half size) Clayton undertype steam wagons. 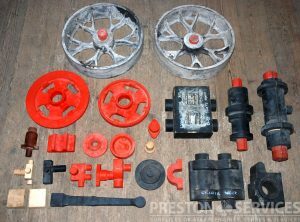 The set includes patterns for all main components inc. cast wheels, cylinder block and engine parts, differential, pump and steering gear, etc. 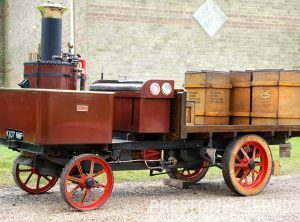 “PRIDE OF PENRYHN” overtype steam wagon, 2″ scale ride on miniature based on the Foden ‘C’ Type 6 Ton wagon. Built to a very high standard. 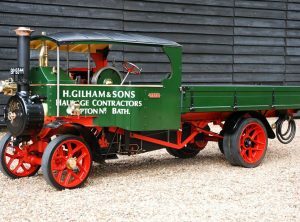 Never used and in excellent, as new condition. 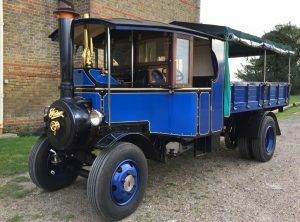 the successful Foden wagons of the 1920’s. 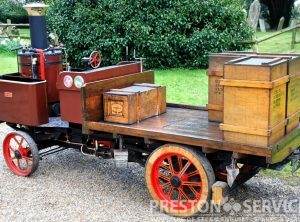 An exceptional example, built to a very high standard and for sale in good condition.